It seems that spring has finally sprung! I love cracking out my sandals and shorts and stuffing my boots and sweaters away for another year. However, I don't really enjoy the big spring clean...using actual cleaning products. Having a toddler who insists on feeding herself leaves for a daily mess in her high chair and the surrounding area. Having a toddler who crawls everywhere and finds the littlest speck of dirt even when you just vacuumed can be frustrating. Having a toddler who splashes more than bathes making your bathtub more like a wave pool leaving puddles on your bathroom floor. After cleaning up the aforementioned daily messes, it's no wonder I don't want to do a big clean "just because". P&G recently sent me some cleaning products, and let me tell you, using some of them actually did make the job more enjoyable. Baseboard & blinds: These areas trap dust and dirt, and can often be neglected. To tackle these tricky areas, run the Swiffer Duster along the surface. My only complaint about these wonderful new products is that Mr. Clean didn't jump of the packing and do all my work for me. 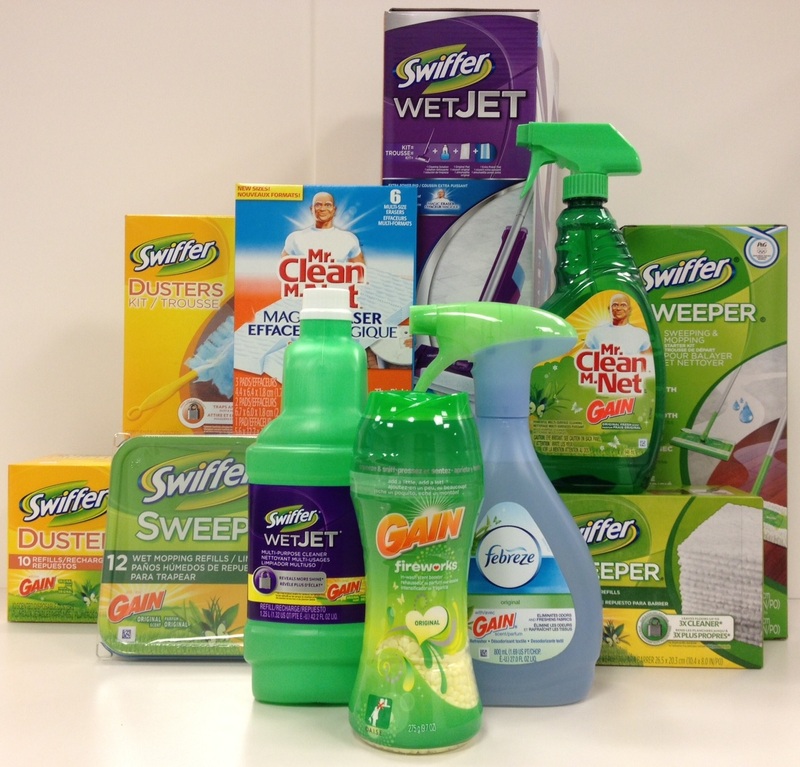 To win some assistance for your big clean, please use the Rafflecopter below. Open to Canadian Residents who are the age of majority only. Valid entries only. Contest ends Wednesday, May 14, 2013. 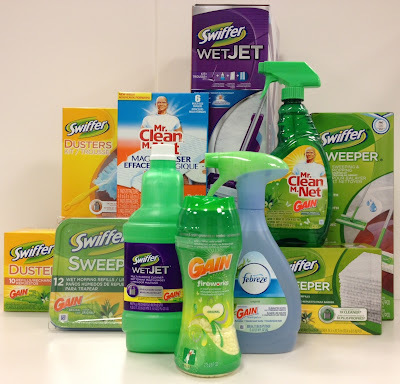 By entering the following contest you are accepting that if you win your contact information will be shared with a P&G PR and shipping agency for the purpose of mailing your prize. Please allow 4-6 weeks from the contest closure date to receive your prize. This giveaway may appear on other blogs as part of the #PGmom program. However, to be fair, you can only win once per giveaway. If your name is chosen more than once, another winner will be selected. For further contest rules, refer to the Terms and Conditions within the Rafflecopter. Those magic erasers are great! Especially for removing crayon off the walls. I finally figured out to do a pre-spring declutter. It's a lot easier to clean if I don't have to keep moving piles of stuff that shouldn't be in my house, anyway! Use newspaper to clean inside and out windows. I also suggest making a list. It helps me focus, and then I can tackle the chores one at a time, so it doesn't seem so daunting. Start at the back of the room and work outward. We do a little every week. We pick one day for 2 hours and work our way through the house. get rid of the winter coats, wash them, and put them away for the season. Don't try to do everything at once! You'll burn out. Tackle a big project every weekend until you're done. basically, just to start doing it, but stay concentrated in one spot because if you clean here and there, you won't see any results and it can get discouraging. I just realized how awesome a job my husbands shop vac does cleaning the roman blinds...Much better than my home vac! My tip is to do your windows first. Then you can open them and let the springtime weather enter and this will motivate you to do the rest of the spring cleaning chores. Write down a list of all that has to be done and tackle them all over a weekend. I find that if I do it all at once it's not that bad. But if I leave things to "later" then they just hang over me. Just concentrate on one room at a time. Focus on one spot at a time. My tip is to have a bucket or container with all the supplies you'll need handy so you don't have to look around once you start. Go slowly if you need to! I do a bit of extra cleaning every day so I don't have as much to do for my spring cleaning. My favourite part of spring cleaning is finishing it. I mean it. (okay, let's try that again and ignore I made that last comment. My favourite tip is to not sweat the small details or the incomplete task or tasks in a given day. It doesn't have to take one day to finish a spring cleaning job. And if you don't get it just right, it's okay. Most people don't even do spring cleaning. So just doing all you did is an accomplishment, not a failure. Just try your best to find some time later on to finish the task. 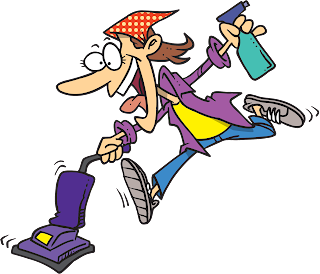 On a related note, prioritize your tasks and get everything in place ready to go as you are ready to cleaning. When everything is in place, you can clean a lot faster if you don't have to search for anything. I put a list on the fridge of all the things I want to do and then for the months of April and May I make sure I complete at least one task a week. The best way to dust blinds is to close them, then wipe up and down with an old dryer sheet. It'll create an antistatic barrier that helps prevent dust from building up again. make a list,,and concentrate on doing only 1 room a day,,makes it a lot easier on yourself. Do one room and one task in the room at a time. The best tip that I have is for using the Mr. Clean Magic Erasers. I use them to clean fingerprints from kitchen cupboards and light switches. I also use them on my floors to remove scuff marks and dirt that other cleaners leave behind. My best tip is to put on your favorite music, wear some lipstick and stick to one room at a time before moving on to the next area! clean one room at a time!!! Clean on a day where it's not so nice out, then you can enjoy yourself out when it is nice. Start from the top and then work your way down to the bottom...you have no idea how much stuff ends up on the floor! Make a list and stick to it until it's all done. Also, start on the small cleaning tasks until you tackle the larger ones. Finish cleaning one room before moving onto another one! I usually try to start at one end of the house and move systematically to the other end - not in swoop though :)! My best spring cleaning tip is start by getting rid of old clothes. That takes care of the mess here. Then extreme dusting lol. Store all of your winter clothing and winter accessories in air tight bags until winter decides to return again! Don't spend the whole day cleaning, it will becoming a real chore that will put you off and you won't stick with it. Just do 3 or 4 hours and stop for the day..
Don't forget to clean those ceiling fans! Set a timer to go off after a certain period of time (maybe an hour). Decide to just work really hard cleaning for that time. It's easier knowing there's an end in sight. Plan to put aside a few days, and get the troops involved! I make a list and a plan and we tackle the house room by room to spring clean. I try to just keep up with the cleaning, not let it get out of hand and then I'm consumed with cleaning for a weekend! My only tip is to have great music on your iPod or playing the background. I usually start in the kitchen, not sure why it is my favorite room to clean. It is usually a visible accomplishment once complete! Take a bit of time every day to do some task or break it up into chunks of time. I REALLY need to get better about a cleaning schedule because I keep our house clean but I procrastinate and try to do it all in one day and get overwhelmed! Thanks for these ideas!